La Mallorquina has been around in Madrid since 1894, and the current shop has been an institution in the Plaza del Sol since 1960. It has three areas – at the front is the cake shop, which sells an amazing variety of traditional baked goods. At the back is the horseshoe-shaped stand-up bar, where you can select a cake, pastry or sandwich from the display that goes all the way around it, and have a coffee or hot chocolate. 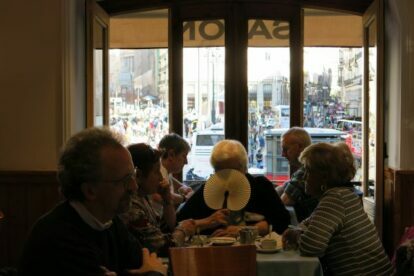 Spanish people are happy to stand while they eat something quick; it takes a little getting used to, but I think this place is the perfect pitstop for visitors to the capital to have a little pick-me-up before doing some more sight-seeing. Personally, I need a coffee an hour at least when I’m on holiday! More than 100 years of tradition, good coffee, delectable cakes and a view to die for – what more could you ask for?